Maitree Siriboon based in Bangkok, Born in 1983 in Ubonratchatani, a province in the north eastern Isan region of Thailand. He moved to Bangkok at the age of fifteen to study first at the College of Fine Art in Bangkok and later at Silpakorn University where he received his Bachelor’s Degree in Thai art major. Maitree is a recipient of numerous national awards among them is The Bualuang award in 2006 found by The Bangkok Bank Foundation. Maitree's early collage work is influenced by his childhood in Isan, transforming half-forgotten snapshots of memories into colourful abstractions of rural life. His childhood landscape permeates his art, a sparkling two-dimensional texture filled with trees, rice paddies, traditional agricultural scenes, and water buffaloes. Later on, Maitree turned more to work with contemporary photography. Some of his remarkable photo series are include Isan Boy Dream invites foreigners to his childhood home Nong-Bo, placing them against characteristic village backdrops. Isan Boy Soi 4 examines, in an idealised fashion, the experience of rural youth transplanted to a big cosmopolitan city and addresses an underlying motif of nightlife labor. 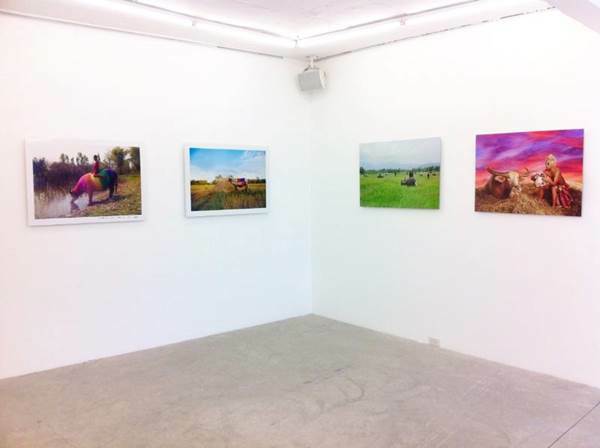 Maitree develops a sensuous and sometimes mystical treatment of models and water buffalos in idyllic pastoral settings. His most current project is focusing on the life of buffalo boys - the children who take care of their families' buffaloes. The work reflects on how an identity of a buffalo has changed in the agriculture society now adays. His photography project has been shown around South east asia (ASEAN) as well as in Brazil, United States, Japan, France, China, Italy, UK, and the Netherlands. Exhibitions include the Guangzhou Triennial 2011, Young Artist Project South Korea 2011, the 3rd Biennial of World Images in Paris 2011, and Art Stage Singapore 2012 and 2013.